MainAll NewsUS & CanadaLooking to Buy Your First Skyscraper? Looking to Buy Your First Skyscraper? If you are looking to buy your first NYC skyscraper, Shimon Shkury says there's no time like the present. 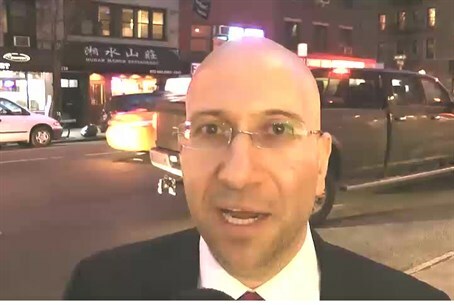 Shimon Shkury, the owner of Ariel Property Advisors, told Arutz Sheva in an exclusive interview about his company's success and recovery from the financial crisis that has hit the US in recent years. Shkury, 42, is a traditional Jew, who started his professional career in the US in the early 1990s, when he received an MBA degree at University of Pennsylvania's Wharton business school. In early 2011, he left Massey Knakal, the largest real estate agency in New York specializing in selling apartment buildings. Along with several other agents from Massey Knakal, he established Ariel, which specializes in the sale of apartment buildings and developing sites throughout New York City. A father of two – Ariel and Avital – Shkury says that the US real estate market is soaring for the first time since 2009. “The market is full of opportunities,” said Shkury. When asked about offers of real estate in the US that occasionally appear in Israeli newspapers, his advice is to check the promises well and make sure they are grounded in fact. While business in New York is competitive and difficult – Shkury says that it is important to remember our strength as Jews, our purpose and goal. A few years ago, his brother Guy died of a disease, and the family decided to establish a fund for scholarships at Israel's Open University, for excellent students who are struggling financially and are having a hard time completing their degrees.